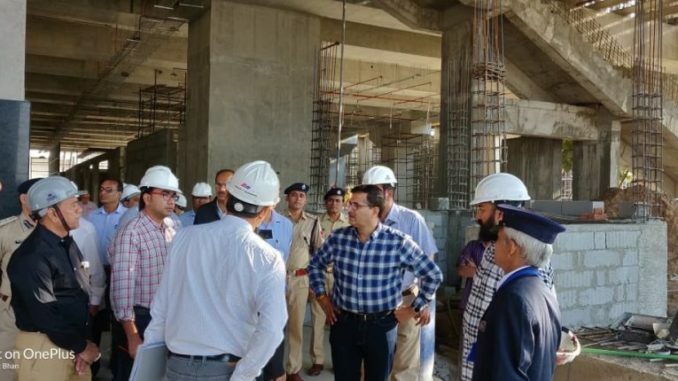 Chairman Railway Board Ashwani Lohani, on 11 Nov 2018, visited the Gandhinagar Railway Station and Hotel development Project site and reviewed the progress of ongoing work. A five star hotel of 300 rooms is being developed in air space above the railway station. This will be the largest hotel of Ahmedabad and Gandhinagar. The top of the hotel shall be 77m high and will be the tallest building in Ahmedabad and Gandhinagar. This will be the first hotel in India which is being being built above railway tracks and on floating columns. A normal 5 star hotel of this size in ground takes about four years to complete. As against that this hotel is targeted for completion by September 2019. The station redevelopment is targeted for completion by Feb 2019. The redeveloped station will have a columnless roof of 105m span which is the largest in India and being done for first time. Shri Sanjeev Kumar Lohia MD & CEO / IRSDC and Shri Dinesh Kumar DRM ahmedabad division along with other officers and contractors accompanied him during his progress review inspection followed by review meeting. CRB directed the project team to finish the entire civil structure of hotel Project by end of Feb 2019 and complete hotel Project in all respect by end of Sept 2019.